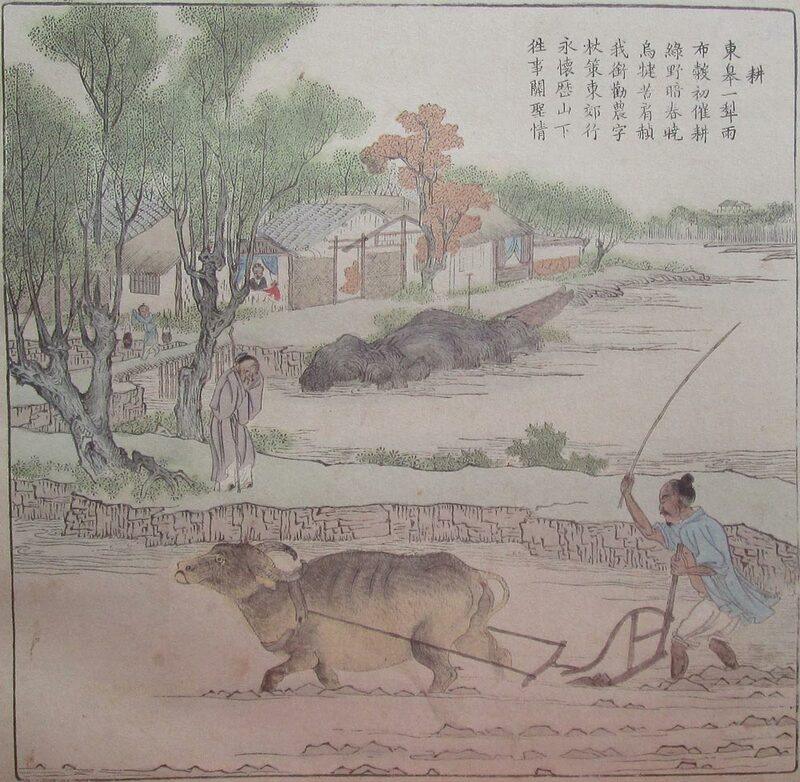 Zengzi (Zeng Shen, 505-436), a disciple of Confucius particularly famous for his filial piety, was also known for living a simple life of poverty. Gui Geng in Fengxuan Xuanpin is a short song; a tentative translation of the lyrics is included below. These lyrics are first set to a melody in harmonics, then are repeated with essentially the same melody in stopped and open sounds; there is no harmonic closing. children like to provide nurture but with parents one cannot wait. It is unbearable that we cannot once again serve our parents. With both parents in the reception hall, daily one can visit (?). 16714.144/1 retire from official life; /2 a qin melody by 曾子 Zengzi. The latter references a footnote to the biography of 張衡 Zhang Heng in the 後漢書 History of the Latter Han, quoting some lyrics that are related to but somewhat different from those here (see below). 2. Shang Mode (商調 shangdiao)? Although grouped with shang mode melodies it has does not seem to have standard shang mode characteristics (see Shenpin Shang Yi), being more like jiao mode melodies (角調 jiaodiao; see Shenpin Jiao Yi). Specifically, gong (do) seems to be the tone of the open third string, and four of the eight phrases in each section end on the note jiao (mi). See also Modality in Early Ming Qin Tablature. 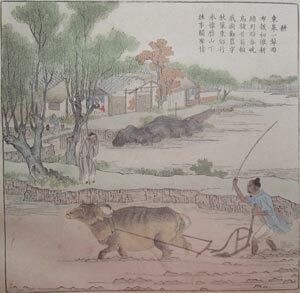 This image is from Images of Agriculture and Sericulture (耕織圖 Geng Zhi Tu), a reprint of the Imperially Commissioned Illustrations of Agriculture and Sericulture (御製耕織圖 Yuzhi Geng Zhi Tu), originally published in 1696 in imitation of 12th century originals. Zha's Guide 16/163/362. Page 163 has several commentaries from other sources, not from qinpu. In the section that repeats the text, two characters (再 and 蠹, the latter perhaps a mistake) are omitted and the second 親 is changed to 觀. In addition some of the tablature in this section is not playable as written (items unclear or impossible to play); in other places changes to the melody are questionable (e.g., writing position 六七, where 六上 would give same note as in the harmonic section).